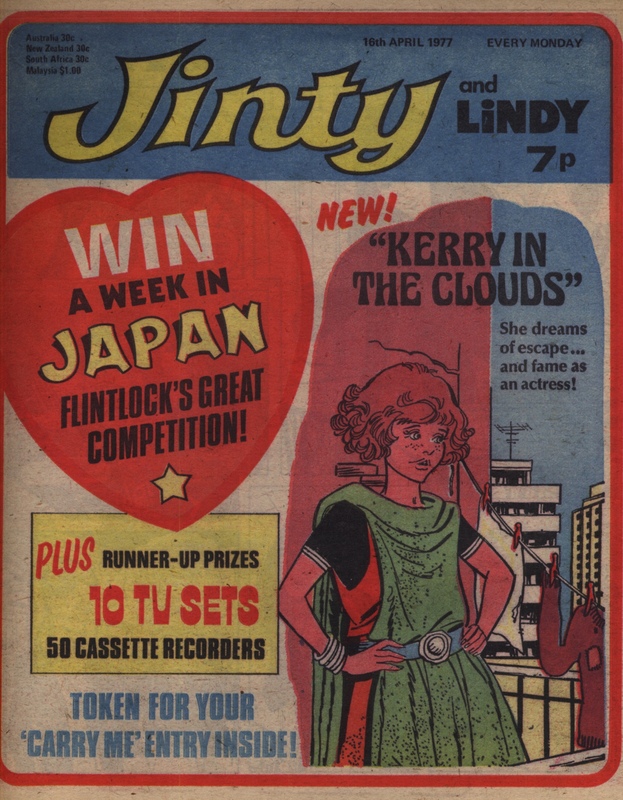 This is the last issue labeled with “Jinty and Lindy” – from next issue the title of the comic will revert back to being simply “Jinty”. 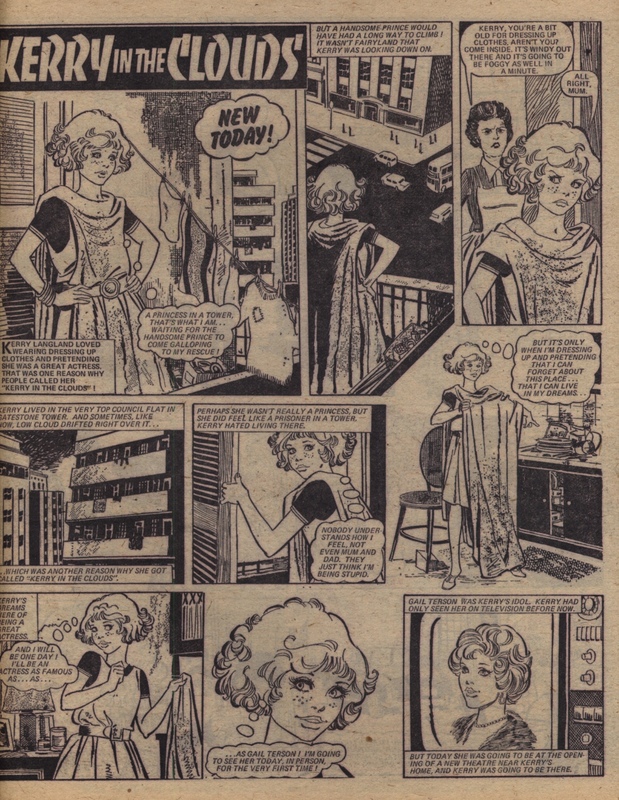 It also marks a transition in cover styles – the previous issue’s cover had a design based on interior story panels but done in a rather boxy, rigid style. 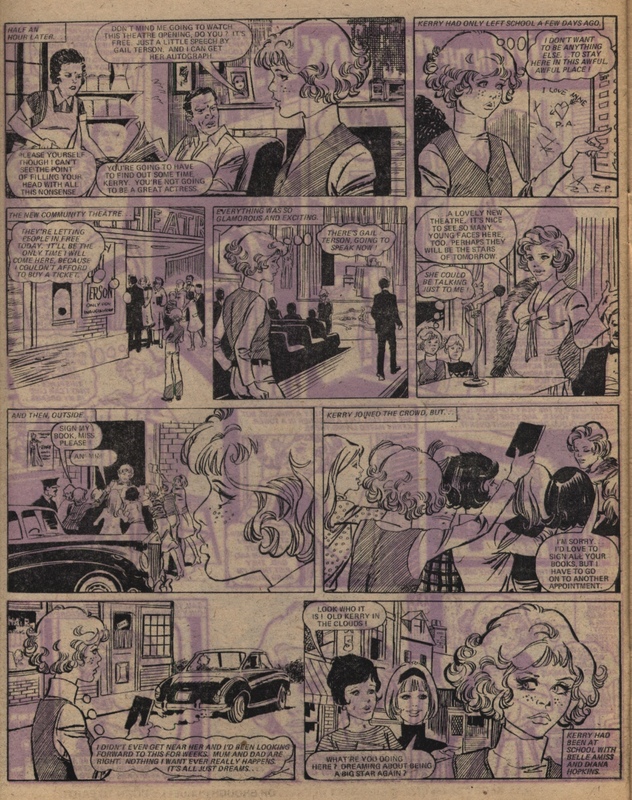 From this issue onwards, Jinty started to use a softer design style, based on interior panels but outlined with a loose line picked out in colour. The title of the comic is still put in a straight-edged box, but from next week this too changes, to a beautiful splash of blue behind the gold lettering. This is a cover that has great memories for me as heralding a fantastic run of the comic. In “Creepy Crawley”, Jean is finding out the power of the scarab brooch, and how it will change her so that she can beat her rival, Mandy. Yes: it makes her lie, cheat, and risk injury to her rivals. Nice! The Gypsy Rose story this issue is a werewolf story, drawn in the evocative style of Keith Robson. Gypsy Rose helps to solve the mystery of the savage wolf which has attacked sheep in the Black Forest. “Spell of the Spinning Wheel” is in full flow: nasty rival Della has left Rowan asleep listening to the hum of her hair-dryer – but luckily it is a battery-powered one which runs down, letting Rowan wake up and join her in training. But the humming bees that Rowan comes across next won’t let her wake up as quickly – even when her head is hanging dangerously near to the fast-flowing stream! “Kerry In the Clouds” starts this week, replacing “Freda, False Friend!”. (As that latter story was drawn by Phil Gascoine and this new one is drawn by Spanish artist Prieto, this means that we are in a relatively rare issue without any Gascoine art.) We have recently found out the writer of this story – Alan Davidson – and I reprint the opening episode for your enjoyment. If you look at the recent post by Pat Davidson, you will also see the first type-written page of script for this story. The cover has a very interesting design. Instead of the more common two panels it incorporates three, in a fan shape radiating from a sun that emphasises it being a “sizzling” comic. In this issue, Jinty closes her competition “If Dad Did”, where readers won money if their letters on the jobs they wish their fathers could do were published. Letters published here imagine their fathers as potters, US presidents, lotto winners, dustmen, disc jockeys, gymnastics trainers and Romany gypsies. In “Creepy Crawley”, warning bells are now ringing that the power of the scarab brooch is getting beyond Jean’s ability to control it. Sheila is the only ray of hope, because she has caught on to what is going on. But what can Sheila do when she does not even believe in herself? A fisherman asks for trouble when he appropriates Henrietta for his own use. And when he puts his fish bait (worms and maggots) in Henrietta – well! It’s part two of “Curtain of Silence”, and several plot threads emerge in this episode that are clearly going to shape the story. First, selfish Yvonne is in for a surprise (and so is everyone else) when she arrives in Mavronia – her rival Olga is almost a dead ringer for her! Second, a gypsy woman warns Yvonne to go quickly because she foresees “bad things” for her. Sounds like good advice, but the arrogant Yvonne isn’t taking it. Third, her arrogance is making her very unpopular with her teammates. The Gypsy Rose story is one of Jinty’s rare forays into the subject of World War II, and it ends on a more tragic note than most of Rose’s stories. Katy the robot makes a mistake that threatens to give her away – she uses too much strength on a bar and bends it. Can she worm her way out of this one? Thumper and Beaky have a narrow escape and are on their way to Julie again. But they’d better hurry, because doctors are not risking an operation on Julie while she is pining for Thumper too much. Rowan tries to replace the evil spinning wheel with a harmless model. As a result, she finds herself in danger of falling down a quarry and is hanging by a thread, er, tree stump. It looks like the mist caused the accident, but Rowan is convinced it is the evil spinning wheel. If so, will it succeed in killing her this time? 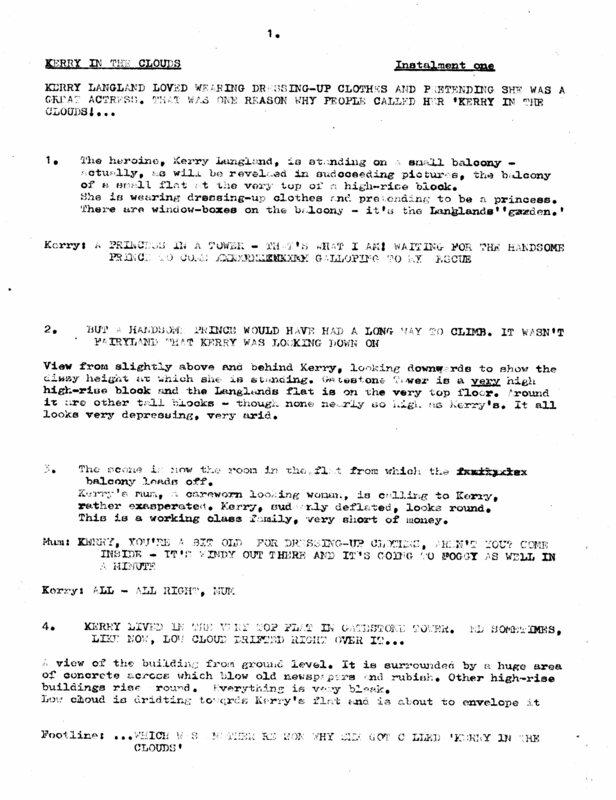 I have found another of Alan’s stories for your computer tests – and this one is actually noted and dated as being for Jinty. “Kerry in the Clouds” ran from April 1977. Copy of the script’s p. 1 of Instalment 1 is attached for interest. This may not have been one of his best as by this time he was focusing more on writing books. It’s perfectly true, as correspondents have recently pointed out, that a writer had to be very prolific to make a good living in the comics market. I’ve located a few more of Alan’s scripts but I’m unable to identify the publications, as he wrote for so many different ones, including Tina in Holland and Editions Aventures et Voyages in France. 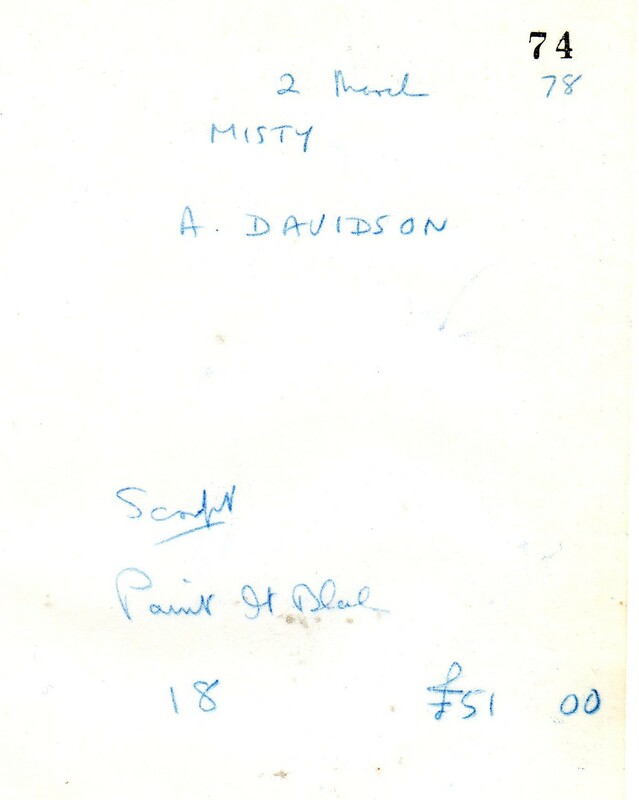 I do remember, as mentioned previously, that he particularly enjoyed writing “Fran of the Floods” and “Valley of Shining Mist” and these were both for Jinty. As for any others, it will be interesting to see what the computer comes up with. [editorial comment] Pat, I’m sure that if you are able to supply titles of stories, the combined knowledge of readers of this blog and other related internet sites will help to identify the publications! “Kerry In The Clouds” is not one of the best-remembered of all Jinty stories and I think it is probably true to say that it is not on the same level as “Fran of the Floods” or “Jackie’s Two Lives”. I do have a soft spot for it though. On Jinty, Neillands drew one serial, “Darling Clementine”, and a humorous regular, “Bizzie Bet and the Easies”. Bizzie Bet was an energetic girl who tries to get the lazy Easies off their butts every week, but the Easies always win in the end. Bizzie Bet lasted about six months (27 episodes), which although reasonable, did not make her a long runner compared to Jinty’s other humorous regulars such as “Gaye’s Gloomy Ghost” or “The Jinx from St Jonah’s”. Guy Peeters is a very popular, long-standing artist in girls’ comics. Regrettably, he has no entry at all at Lambiek Comiclopedia and no other information on him is currently available, except for a listing of his works on Catawiki. It is only due to the Tammy credits that his name is known, but it is possible that it was a pseudonym. Peeters was a very prolific artist at DCT, with his artwork appearing in Nikki, Mandy, Judy and M&J among others. His best-known work at DCT is arguably Penny’s Place, which started in M&J and then moved to Bunty with a merger. An incomplete list of Peeters stories at DCT can be found here. At IPC, Peeters made his strongest presence in Jinty, particularly in regard to her SF stories. SF was one of his strengths, and his style really brought several of Jinty’s SF classics to life, including “Land of No Tears” and “Worlds Apart”. Peeters also brought off sport well, but only did one sports story for Jinty, “Black Sheep of the Bartons”. It is rather surprising that he also drew a ballet story, “Slave of the Swan”, and also a complete story, “Forget-Me-Not at Christmas”, which contained period elements, as his style is less suited to ballet and period stories than other artists. In Tammy, Peeters’ artwork appeared more intermittently. He drew nothing for Misty, despite his aptitude for SF. But he did draw one of Tammy’s best-remembered SF classics, “E.T. Estate”. This was during Tammy’s credit run, which gives a name to this hugely popular artist.